This is the public profile of Vladimír Raška, Additional information and high-resolution images are available for accredited press members, to access additional information about Vladimír Raška please login as a press member. About Vladimír Raška : Vladimír Raška has been working for multinational distributors of alcoholic drinks such as Sovesco, Allied Domecq or Global Spirits in the Czech Republic for several years. Since 2003 he has dedicated to product design. 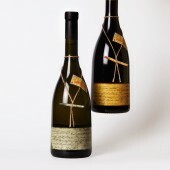 He has had significant achievements in international competitions in USA where he has won two silver medals in San Francisco International Wine Competition(2012) and gold medal in Denver International Wine Competition (2013) for wine labels design. Behind the ambitious design of brand Piero di Gardi stand three people. Aneta Rašková, Simona Rašková and Vladimír Raška. Two students of the Metropolitan University in Prague and the University of Technology in Brno and their father- experienced brand manager. Their charismatic project is like a cinematic story. Enthusiastic author with great idea of attractive design was rejected by dozens of companies. Then he conquers the world by his own hard work and determination. However it requires not only courage and a little bit cheekiness but especially original great idea. Wine label design, story of brand Piero di Gardi and good fabricated marketing project is realized by authors of ideas in the Czech Republic. Authors of original design are opened to cooperation with a great distributing company across Europe. Press Members: Request an exclusive interview with Vladimír Raška.